American Express House was conceived with the concept of speed in mind. 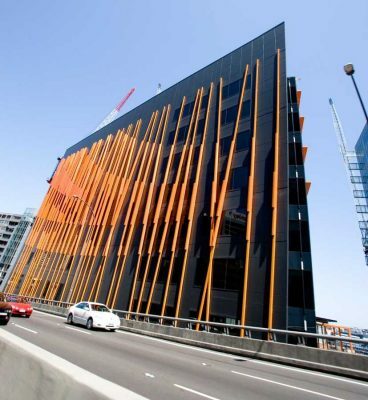 The site, located adjacent to a bend in the elevated Western Distributor freeway, slices aggressively through the western side of Sydney’s central business district. As a result, the building is experienced at speed by large numbers of passing motorists. Determined by a specialist study, the design creates a “contour map” emphasised by changes in colour saturation – hence the orange colour. The blades also reduce external solar loads in the morning sun and provide a psychological buffer zone for workers near the façade. The building foyer opens onto a through-site link activated by cafes and water features with direct connections to the public plaza in the space beneath the distributor and through adjacent sites to Wynyard Train Station. This through site link is protected by a glazed awning that spans across to the adjacent KPMG building.